From a photograph of the Johnsonville Rugby Football Club Senior Team, Season 1937 held at the Johnsonville Rugby Football Club rooms. 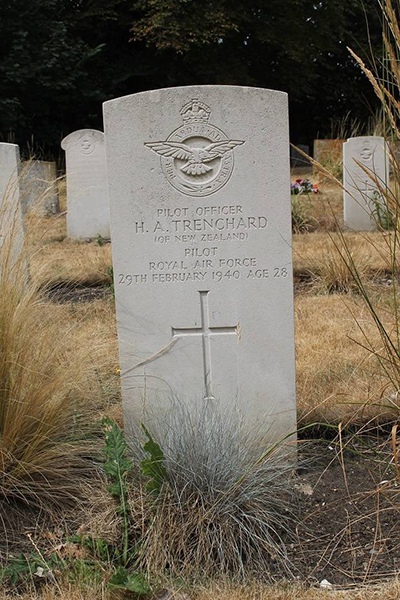 This article is written by Claire Bibby in memory of former Glenside resident, Horace Trenchard, a New Zealander in the Royal Air Force who died in active service during World War II. In 1937 at the age of 25, Horace Trenchard was the guest of honour at a farewell party in Glenside. Horace was about to sail to the United Kingdom and take up a four year commission with the Air Ministry. At the time he was single. Former Glenside residents recall that his father had died before his birth and his mother was distressed at the thought of her only child, her husband’s name-sake, leaving home for armed service. 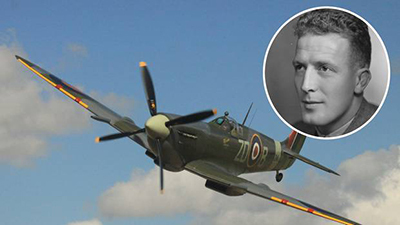 Horace joined the Royal Air Force and died on 29 February 1940 undertaking a night training flight at Duxford, Cambridgeshire, England when his Spitfire crashed. Horace Arthur Trenchard was born at Lower Hutt on the 5th March 1912, the only child of Mary Celia and Horace Arthur Trenchard. Horace's father died before he was born and Horace was subsequently named after his father. Some time after this the Trenchard’s came to live in the Johnsonville area, as Horace was enrolled at Johnsonville Primary School in 1919. It is known that the Trenchard’s bought a house on the main road in Glenside and lived there. This is now the address of 219 Middleton Road. The family became very close friends to the Stebbings. The year Horace left New Zealand to train in the Royal Air Force, the Trenchard’s house was purchased by Len and Mollie Stebbings to be their first marital home. The following information is obtained from Horace’s application, in February 1937, to take up a Commission in the Royal Air Force. At the time Horace provides his address as Glenside, Johnsonville until March 30 1937. 1926-1930 educated at Waitaki Boys High School, Oamaru. Enrolled in the Cadet Corps, attaining the rank of Battery Sergeant. Captain of the College 1st XV Rugby team for three years. Took up boxing for two years and tennis for two years. 1930 returned to Glenside. Captain of the Johnsonville Senior XV rugby team. Represented Wellington in the Senior Provincial side. 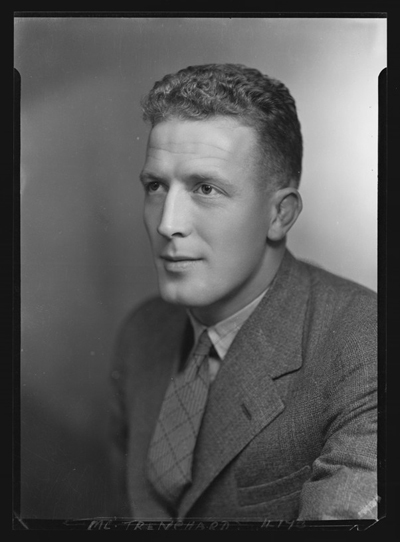 (Len Stebbings said he played fullback for Wellington at the time Horace's cousin Jarman was suspended). Member of the Johnsonville Tennis Club. Obtained his “A” flying licence. Trained by the Wellington Aero Club and the Wairarapa Aero Club. Employed by the Wellington Meat Export Company as an assistance clerk in the Wool Department, preparing wool samples. (It would appear Horace obtained this work through his mother’s side of the family. Her sister married A G Jarman, who was the Manager of the Department). Left this employment after six years service to take up a position in the Wellington Harbour Board and undertook clerical work on the Export of Wool Shipping Specifications. February 1937 applied for a Short Service Commission in the Air Ministry and left New Zealand for the United Kingdom on 12 July 1937, on the ship S.S. Rotorua. Gwen Silvester lived in Glenside at the time Horace left New Zealand. She said that the community put on a big farewell for Horace, who was known as Horrie. It was held at the Pilbrow home on the main road in Glenside. This is now the address 271 Middleton Road, Glenside. It was a big event as Horace was very popular. Gwen described Horace as handsome and said he was "liked by the girls". 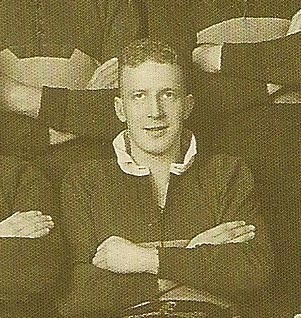 The late Murray Henderson described Horace as his school boy hero and said he was held in high regard by many school boys due to his popularity and being Captain of the Johnsonville 1st XV. On 12 July 1937, Horace embarked from Auckland on the S.S. Rotorua for the United Kingdom. 24 August 1937 - Trained at the Civil Flying School, Sywell Northamtonshire; Royal Air Force Depot, Uxbridge, Middlesex and the No.9 Flying Training School , Hullavington, Wiltshire. 3 June 1938 - Posted for ferry pilot duties to the Ferry Flight, Cardington, Bedfordshire and later Felton, near Bristol. 20 October 1939 - Posted to No 19 Squadron, Duxford, Cambridgeshire. 29 February 1940 - Whilst carrying out night flying training flight in a Spitfire fighter, crashed in the vicinity of the aerodrome at Duxford and received fatal injuries. Buried in Whittlesford Parish Churchyard, Cambridgeshire in the section occupied by the Royal Air Force graves. b) Inexperience of pilot flying in “blackout” conditions. (1) That the accident occurred 3 – 4 minutes after take-off. (2) That a comparatively inexperienced night pilot when taking off in conditions of “blackout” with little or no horizon, can easily lose his sense of altitude. (3) That all aids to instrument flying be fostered. (4) That a leading light such as a mobile beacon or money flares be placed 1 to 2 miles up wind and to the left of the flare path. The Air Officer Commanding remarked that he concurred with the findings and recommendations 1, 2 and 3 but said that in respect of 4, orders were already in existence for the provision of leading light and flares. Source: Flying Accident - Precis of Proceeding of Court of Inquiry dated 21/05/40. At the time of Horace’s death, Mrs Trenchard was no longer living in the North Island. She had moved to the South Island where she was staying with the Jarman family at Hororata, west of Christchurch. It was here she received a telegram of sympathy about her son's death from the New Zealand Minister of Defence, the Hon F Jones. However, the circumstances of Horace’s death were never communicated to his friends back home in the Glenside and Johnsonville area. Due to the uncertainty over the circumstances of Horace Trenchard’s death and to allow closure for his former friends and acquaintances, his War Records from the NZ Defence Force archives were obtained in March 2005. A copy of the précis of the War Inquiry was passed onto the Stebbings family. An item in remembrance of Horace was published in the Glenside community newsletter in April 2006 and was well received by those who knew him or about him. In 2018, Dilip Sarkar MBE, a Fellow of the Royal Historical Society and prolific author, contacted the NZ Herald, and subsequently Claire Bibby, seeking information about the impact of Horace Trenchard's death. Dilip is writing a book about the casualties and survivors of the 19 Squadron 1938-41, the RAF's first Spitfire squadron. Dilip e-mailed "My work is very much about the human experience of war and effect of casualties on those left behind, and, indeed, how this reverberates down the generations and still has currency today. It is sad that so many pilots like Horace were killed in flying accidents and are largely unknown." 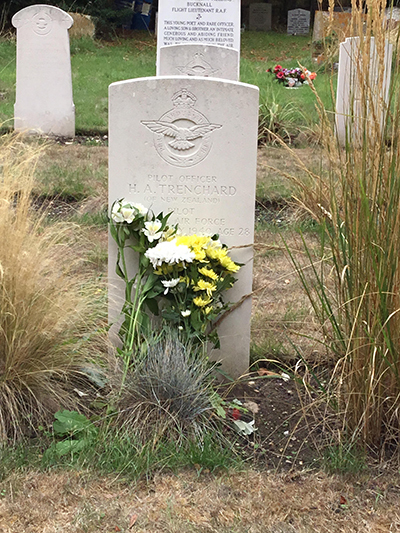 On August 23, 2018, in response to a request from Claire Bibby, Dilip and his son James placed flowers at Horace Trenchard's burial site. 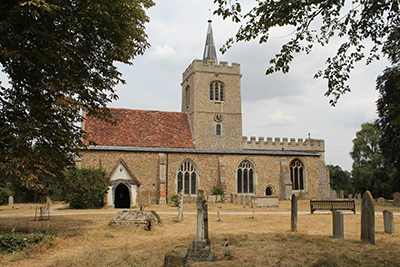 They also placed flowers at the headstones of two other men of the 19 Squadron who are buried at Whittlesford Parish Church. Mrs Ethel Florence Stebbings (1874-1951) mother of Len, Eva and Eileen Stebbings was a life-long friend of Horace Trenchard’s mother, Mrs M C Trenchard. Len Stebbings said he knew the Trenchard family through St John Anglican Church which the Trenchards and Stebbings attended. The Stebbings used to provide Mrs Trenchard a lift to Church as the Stebbings family passed the Trenchard’s home on the way to the service. 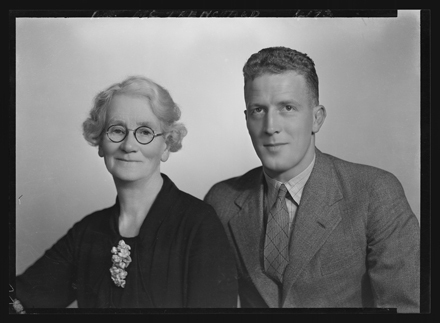 Len Stebbings and Mary (Mollie) Hallewell were married in 1937. 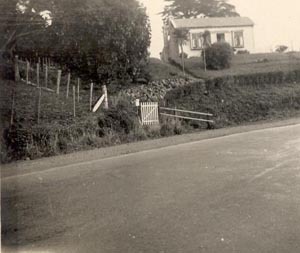 The Stebbings bought the Trenchard’s cottage and Len and Mollie lived there for several years until their new home was built up the end of Stebbings Road in 1942. After they moved into their new home, they sold the former Trenchard cottage to Bob McNair, a cousin. Here are other Stebbings memories. NZ Defence Force Personnel Archives. Lest Tawa Forgets by Bruce Murray, Tawa Historical Society 2008.